Feeling a bit, warm? Well, it IS that time of year, again… so let’s chill up some wine. Of course you can drink any kind of wine, any time you like. But I find, generally speaking, that as the weather warms up, wine drinkers naturally shift to lighter, chilled whites and rosés. If you’re with me on this, I’ve got some tasty recommendations here, and some easy food pairing tips, that should help kick your experience up a few notches. Watch here to learn more wine tasting tips! Wine can be difficult to understand, and wine pairing, downright impossible for many. But I’d really like to sell you on the idea of pairing wine and food together, because when it’s done right – it can be existential. In the best scenarios, the two things come together to make something greater than the sum of its parts. Without getting too technical, my simple advice for partnering wine and food is this: Think of wine, as a food. Every glass contains a profile of familiar flavors, layered together. For example, some wines are dominant with red fruit flavors. Some can be herbal like strong tea, or savory like a steak. Some wines are nutty, toasty, or woody. When you know the basic character profile of a wine, it makes it much easier to partner up with food. You can guess that an herbaceous white wine would probably go well with an herb-rubbed chicken. And a fruity red wine that tastes like raspberries, is going to be great with a creamy brie. If you’d like to go deeper yet, check out my video, above, on the right. And with that, I’d like to share five exciting wines with you, give you a little background, flavor profile and then a few easy foods that should be a sublime partner for any of these selections. Kelly and Chris Sparkman launched Sparkman Cellars in Woodinville, Washington in 2004 to focus on their family, of all things. They believe wine and winemaking brings people together. “Fusing Art, Science, Agriculture, Philosophy and all the Good Stuff from Life into a bottle of wine that we are proud of, is both a challenge and a reward,” says Chris. The Wine: Made with French Rousanne, Grenache blanc and Marsanne, Apparition, “attacks,” the nose with exotic Asian spices, parafin wax and almond extract. The palate is full, with layers of nectarine, honey, peaches and lychee. It was aged in neutral oak and on the lees for a fresh, but creamy, finish. Pairing: Whenever you have a white wine that exhibits exotic fruit and spice flavors, the first place my thoughts go to – ginger. Crisp, dry white wines like Apparition, work so well with sushi and Thai foods because they’re clean and refreshing. They don’t get in the way of the food, as much as they float over top of it. And ginger, just explodes when it’s combined with fruity flavors. If you prefer something a little more savory, try making some Coronation Chicken Salad. This dish uses ginger, plus curry, too. PA residents: Buy Apparition here. Sheldrake Point Winery, located on Cayuga Lake in New York’s Finger Lakes region, has been in business since 1998. The 160 acre lakeshore site was operated as an orchard and dairy farm from 1850 until the mid 1980s. Owners Chuck Tauck and Fran Littin transformed the property into today’s winery and vineyard. The Wine: The Finger Lakes region is quickly becoming known for its award-winning, Germanic-style white wines. This beautiful Riesling smells of ripe peach and tropical fruit, perfect for warm weather. Light hints of lime and lemon peel create a tangy mouth-feel and a refreshing, soft, mineral finish. Cajun chicken salad with poached pears. Pairing: This is clean a versatile wine, and would go well with sweet and savory appetizers as well as seafood dishes, whether you’re doing grilled cajun shrimp or pesto pasta, it doesn’t get more light and summery than this. Dry Riesling is also fantastic with honey-glazed hams and Thanksgiving turkey, so if you’re looking for a summery version, go with a lighter ham and corn chowder, or a grilled turkey panini. Gilbert Cellars is a small family winery in Yakima, WA that began in the late 1800s as a fruit farm. Within sight of their own family mountain (seen on the label), Owners Charlie and Gloria Gilbert now make wines that showcase what (they feel) Washington grapes are all about. They want the pure flavors to shine through unimpeded, into the glass, so people can “taste,” Washington – crisp, pure, clear and intense. The Wine: This 2015 rosé is made in the style of the wines of southern France, from the Mourvedré and Grenache grapes. It displays a wonderful perfumed character interlaced with grapefruit, peach and white pepper. Vibrant and intense, like the glacial water that flows down from the Tetons, the wine is soft and juicy in the mouth. Pairing: The Gilbert rosé has flavors of grapefruit, peach, and a snap of white pepper on the finish. In this case, I suggest we mirror all of those flavors and pair it up with a watermelon, blue cheese, and arugula salad. The tanginess of the blue cheese locks in with the wine’s tang, the sweet watermelon fruit plays alongside the peach, and the spicy arugula links up those white pepper notes. If you prefer a less-peppery experience, drizzle some honey in for a hint of sweetness. PA residents: Buy Gilbert Cellars’ Rose here. Located in the legendary Sonoma Valley of California, Highway 12 Winery (also the main thoroughfare) is a project founded by fourth-generation winemaker Michael Sebastiani and partner Paul Giusto. This region has been at the heart of Northern California’s Wine Country since the first plantings in 1825, and the two partners wanted to pay homage to Sonoma’s rich wine tradition. If you want the full story, we did a feature article on Highway 12 here. The Wine: This rose is made from Pinot noir, and has a beautiful salmon hue. Peach and white blossoms are the first things that come up on the nose. The wine is bright and acidic, with some weight on the palate, it’s clean, balanced by soft yet subtle strawberry, watermelon and a touch of wet river stone (mineral). Pairing: This wine tends to lean more in the direction of red fruit and juicy berry, and would be a great pairing with a fruity, roasted beet dish. Goat cheese and beets are a solid duo, and the creaminess of that cheese will be a good balance for the sharp acids in this wine. If you want to go more complex, you can either add some slices of salty duck prosciutto, toasted sunflower seeds, and even some cracked black pepper to bring those floral notes out. PA residents: Buy Highway 12 Rosé here. The Wine: Made from 100% Cabernet franc, The 2014 rosé is floral and fruity, with an interesting herbal scent. It makes me think of orange peels, strawberries and sage. The sage/herbal smell is neat; typical of the Cab Franc grape when grown in a cooler climate. It’s zingy, acidic and lively, and you get this rush of tangy grapefruit, berries and even some minerals as it fades out on your tongue. Pairing: I’m homing in on that sage/herbal scent and thinking we’d do well to pair this up with grilled pork chops, rubbed with either sage or rosemary. I also have a recipe here for a sage and citrus balsamic loin that you might want to try. The wine is crisp and bright enough that it can hold up to the weight of the pork, especially if you throw it on the grill and get some caramelization going. PA residents: Buy Sheldrake Rosé here. No, like, really cool. Just as much as I love watching the seasons change, I also enjoy the range of moods and flavors that seem to go along with seasonal wine choices, too. Wine doesn’t have to be complicated, it doesn’t have to be expensive, and you certainly doesn’t have to follow anyone’s rules. Just chill up a bottle or two and follow your instincts. The first time I ever tasted Chablis, it was 1980… I was eight years old. Shortly after the Chablis incident. My grandparents’ house was the place for family gatherings, and on Catholic holidays they’d serve up traditional Polish American fare: pierogis, sauerkraut, flounder, along with a big jug of white Chablis. Wine seemed pretty important; after all, priests drank it, so I asked if I could try some. I remember not liking it too much, and it turns out my instinct wasn’t off, even for an eight year-old: That wasn’t real Chablis after all – ‘twas made in bulk, in California! But thanks to those memories, some thirty years later, many of us still think Chablis is a jug wine that you drink to repent for your sins, or sometimes, to marinate your pork ribs with. But true Chablis, and the region it comes from – Burgundy, France – are responsible for some of the best wines in the world. And Deschere’s has some… so read on, to re-educate your palate! The Burgundy region of France is located east-of-center, close to the country’s border with Switzerland. In the Middle ages, the area was under strong influence of the Roman Catholic Church. Coincidentally, men of the cloth had a lot to do with Burgundy’s rich wine heritage. As Churches acquired land, Cistercian and Benedictine monks experimented with wine grapes and vineyards. They became so intimately familiar with the vineyards, that they categorized and ranked all of the different parcels throughout. This system was so reliable and accurate, that most of those vineyards still remain over 1000 years later. The best wines come from the Grand Cru (Great Growth) and the Premier Cru (First Growth) parcels. A typical village in Burgundy. Note the church... every village has a church! The vineyards are still delineated as the local Monks decided, 1000 years ago. Standing over the famed vineyards of Romanee-Conti with my wife. Confusing as French wine labels are, there are only two main things you need to know about Burgundy wines: Most whites are made from Chardonnay and most reds are made from Pinot noir. What Does Burgundy Wine Taste Like? The chalky soil of Chablis are said to give the wines a strong mineral character. For those who are used to drinking California Chardonnay, Burgundy Chard is a bit of a surprise. French winemakers prefer their wines to be, “naked,” meaning they don’t like to interfere with the natural character of the grape too much. Burgundy is crisp, subtly fruity, lighter and certainly, has less oak. Burgundy Reds made from Pinot noir tend to be very light and elegant, some may even call them feminine: They’re subtly beautiful with an underlying complexity that only reveals itself upon closer inspection. You’ll taste fresh strawberries, raspberries, smoke and cedar from French oak barrels, and in older wines, a hint of earthiness. Although it’s a part of Burgundy, Chablis is a satellite that sits further north, close to Champagne and Paris. Temperatures are much cooler here, and therefore, make for wines that are very sharp, acidic and light. Chablis wines typically use little-to-no oak, so these are even more naked than Burgundy. La Chablisienne was founded in Chablis, in 1923. This top-ranked wine (Premier Cru) is practically as good as it gets! For its pale yellow color in the glass, the first aromas you get are of spices, toast and white fruit. The wine has finesse and complexity, it is fruity, floral and chalky. The long, mineral finish and acidity linger… Perfect for cooked shellfish, and raw-bar staples like oysters, clams, and scallops. Another first-growth wine, this one is also a pale yellow color with some light green glints. The expressive nose of white peach and apple is enhanced by a touch of soft vanilla. It’s fresh and lively in the mouth with a ­flavor of white-fl­eshed fruits, white flowers and minerals. The lingering finish ends both rich, and slightly spiced. This would be a great compliment to poached lobster and sweet King crab legs. This is Pinot noir as it should be – the true, original from Burgundy, France. Often lighter and more elegant than New-World versions, this is a wine with subtle finesse and flavor that is perfect with lighter fare. Elegant aromas of crushed raspberry and strawberry with a hint of earth. French Pinot is amazing with roasted fowl, especially turkey and duck, and with creamy, stinky cheeses. Terres Secrètes was founded in 1928, and its world-famous Chardonnay is at home in the Macconais region of Burgundy; the grape actually takes its name from an ancient village there. This is one very expressive wine: clear and bright with aromas of white flowers, citrus and yellow fruit, smooth and full in the mouth. Burgundy Chards are great with butter-poached seafoods, escargot, and roasted poultry. As far as California wine goes, Napa Valley gets a lot of attention, but fewer people know about Sonoma and its rich wine heritage. Located 60 miles north of San Francisco, the two regions may be close in proximity, but not necessarily in spirit. Sonoma is just 45 miles from the California coast. Situated like a giant horseshoe, the two Valleys are separated only by a small range of foothills and connected at the bottom. This is where Napa’s Route 29 meets Sonoma’s Route 12. For Sonoma, Highway 12 is the main artery, home to dozens of wineries, but also symbolic as the central lifeline of the region. Wine has been made here for a long time. Once a part of Mexico, Russian colonists planted the first grapes in 1812. In 1825, Padres of the Sonoma Mission planted the first vineyard in what would later become the Highway 12 Wine Corridor. And in 1857, Sonoma became the location of the first commercial winery (Buena Vista) in the then-new state of California. Long known as a supplier of wine grapes, Sonoma grows substantially more than its sister to the east, and still supplies them in bulk to many Napa wineries. To this day, it feels more like a rural town, with rustic B&Bs, small restaurants and bars; whereas Napa is a bit more glossy and upscale with its spa retreats and Michelin-Star restaurants. Both places make outstanding wine, but Sonoma seems to have an easygoing spirit that really shows itself in the wines produced here. Highway 12 owners and winemakers, Michael Sebastiani (left) and Paul Giusto (right). Many of the original immigrants to this area were Northern Italian or from other wine-growing regions of Europe. Families like the Sebastianis have been making wine here since 1904. Over three generations of family members grew the Sebastiani brand into one of California’s largest and most well-known. With that heritage in mind, fourth-generation Michael Sebastiani and partner Paul Giusto decided to venture out with a new winery, but not wander too far — really, at all — off the road. Vineyards in the Sonoma Hills. Napa is in the middle ground, the Mayacamas in the Background. To find the perfect grapes, Michael and Paul source their grapes from Sonoma, Napa and the foothills of the Sierras, putting longstanding friendships with neighboring growers to use. “It all Starts in the Vineyard,” is the mantra and the guiding principal at Highway 12. From the vines of those master growers, passing through three generations of wine growing experience in the winery, and into the bottle – you can taste it all, in every sip. The inaugural release for Highway 12, sourced from the Delta-Clarksburg region. A minimalist approach to winemaking makes for a bright and lively wine with a nose of elderflower, citrus and stone fruit. Crisp Asian pear dominates on the palate. It’s a fruity and floral wine, finishing off with a rich toasty vanilla oak warmth. Perfect with BBQ chicken, buttered shellfish and just perfect on its own on a warm day. Aptly referred to as SRB, this blend delivers massive quality and structure in a bright and luscious Sonoma style! 63% Merlot, 14% Syrah, 10% Cabernet Sauvignon, 9% Petit Verdot and 4% Malbec, the wine was aged in French oak for 14 months and showcases a full-bodied richness. A bright bouquet on the nose with hints of ‘dust’ give this wine it’s unique character. This wine will stand up to and surpass most Red Blends in it’s price category! Perfect for hearty tomato-based pasta and stews, or maybe just fireside at your favorite ski lodge. Depth, strength and elegance in one wine! Bright, yet luscious, this Cabernet (with a touch of Cab Franc and Merlot) is full of cedar and oak, cherry, blueberry and a soft, vanilla-oak finish. An easygoing, versatile red that’s great for a variety of settings, from casual apps to grilled BBQ. Looking for delicious, unique and fantastically affordable wine? Portugal is often overlooked by wine lovers, and that’s a real (or should I say Royal) shame! The steep, terraced vineyards of the Douro. The Douro originates in Spain, meanders through the northern quarter of Portugal, emptying into the Atlantic. Touriga Nacional grapes left after harvest season in October. Portugal is best known for its sweet, fortified Port wines, made in the breathtaking Douro region, a UNESCO World Heritage Site named after the river that runs east to west, across the top quadrant of the country. Most Douro vineyards straddle the river itself, perched on steep, terraced cliffsides that must be managed and harvested by hand. The terrace walls are made of manually-stacked rocks that, in some cases, are centuries old. The climate is extreme, marked by cold, wet winters and hot, dry summers: So hot, that oftentimes grapes need to be harvested at night so they don’t spoil. The grapes are still tread by foot in giant concrete pools, called Lagares, just as they have been since the beginning. By default, and by necessity, sustainable production is a way of life in this environment. Over eighty different types of indigenous grapes are grown in the Douro, ones with names that will tie your tongue in knots: Touriga Nacional, Tinto Cão, Viosinho, Souzao, and Rabigato, to name a few. Many of them go into the finest port wines. But those same grapes can, and do, make fantastic dry wines too. The entrance to Real Companhia Velha's cellar. Soft, silky mold covers the bottles in the RCV library. A bottle of port (under the glass dome) from the very first vintage of the company's founding, 1756. Deschere's own Zach Carey tastes wines and port wines from RCV. For over 250 years, Real (pronounced REY-al, meaning, Royal) Companhia Velha has quietly survived, even thrived, in this challenging region. Founded in 1756 by the Royal Charter of King D. Jose 1, it’s the oldest family-owned wine company in the country. The winery has quite a history, from shipping its Port wines to Catherine of Russia, to rationing Napolean Bonaparte’s troops in the famous French invasions. In the 1990’s, the Company restructured it operations, bringing its production up to par with the modern wine industry. Consisting of five separate Quintas, essentially, farms, the winery occupies Over 1,300 acres on the Douro. They make everything from sweet Port wines (under the Royal Oporto label) to olive oils and of course, premium dry wines. Rated 90 Points by Wine Spectator, ranked #39 on their, “Top 100 of 2015” List. Porca de Murça is the Douro’s leading brand, and with 90 years of history, one of Portugal’s oldest wines. The name originates from a folktale about a mighty female boar (a Porca) that once terrorized the village of Murça. Porca de Murça is a blend of four Portuguese grapes: Touriga Franca, Touriga Nacional, Tinta Roriz and Tinta Barroca. It’s a fresh and intense wine, full of ripe red berry and cherry flavors. Velvety and well-balanced, this wine would be a great partner for roasted poultry and pork. Rated 90 Points by Wine Spectator, ranked #50 on their, “Top 100 of 2016” List. Evel is also one of the oldest wine brands in Portugal (104 years old). With no specific meaning, the word Evel is an anagram for the Spanish word, leve (light). 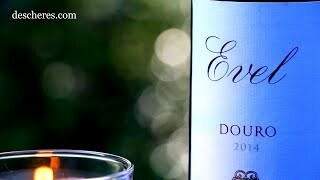 Much like its name, Evel is an elegant, smooth and enjoyable wine. Made from three indigenous grapes – Touriga Nacional, Touriga Franca & Tinto Roriz – the wine is fresh and acidic, full of red berry and plum flavors, with a hint of black pepper and mineral on the finish. Although you certainly can (and should) enjoy it now, it could age at least another five years! This is an easy drinking and juicy red that would be a great compliment to grilled meats, especially beef. Ask a wine drinker if they like Malbec, and they’ll say, “I love wine from Argentina!” even though the grape is originally from France. And while, five years ago you could almost count on there being a bottle of something from California on a person’s kitchen counter, these days it’s more likely Argentine. It is indisputable that Argentina has become a hot spot for wine lovers, and for good reason. So much great wine is being made here now, that you can buy world-class drinks for half the price of more famous regions. The country is the fifth largest wine producer in the world. Most of this volume comes from one region alone: Mendoza, located west, in the foothills of the Andes mountains, along the border with Chile. This is where you’ll find the Gouguenheim winery. Born in Argentina to French parents, Winemaker Patricio Gouguenheim has been crazy about wine since his childhood. Originally a professional in Mergers and Acquisitions, his work took him to Mendoza during the economic crash of 2002. It was there that he first learned of an old winery in nearby Uco Valley, in disrepair and up for sale. A wild seed was planted, and in a move that his two daughters called, “mad,” Patricio decided to hang up his suit and tie – and start making wine. The winery has 98 acres of vineyards, located at over 3,600 feet above sea level. With a desert climate and 320 days of sun exposure a year, meltwater from the snow of the Andes Mountains must be carried by irrigation channels, through the sandy soils, to the vines. There’s a big temperature difference, called a Diurnal Swing, between day and night, that allows for the perfect ripening of the grapes. Does all of this sound good? Be sure to look for Gouguenheim wines in your local PA Fine Wine & Good Spirits Store. We also import their Merlot, Chardonnay and a Torrontes too… all similarly great buys! Autumn is here, soon to bring the inevitable rush of the holidays. Rather than add to your stress, we at Deschere’s prefer to help you avoid it; so, here are five deliciously-different wines to stock up on now. We feel that wine is not only beneficial – actually, necessary – for your health and sanity, especially during the holidays! Whether you’re going to a party, or throwing one, sparkling wine is a must: But you don’t need to break the bank on expensive Champagne! Washington’s Treveri Cellars makes bubbly on par with fine Champagne, but for much less. Their 91-point Blanc de Blanc (100% Chardonnay) is great for celebratory toasts, appetizer courses and even in mixed drinks. 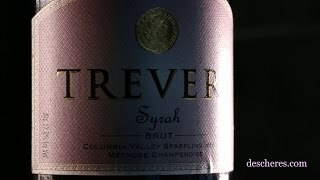 We’re big fans of their entire line of award-winning wines, and predict Treveri might even become your new go-to for New Year’s Eve! 3) Rosé Season is NOT Over! 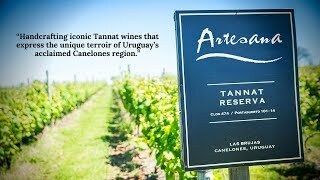 Artesana Tannat rosé has a very interesting background story: It’s made from a French grape, in Uruguay, South America, by two women winemakers. Slightly more full-bodied, citrusy and lip-smackingly tart, it’s perfect with just about any kind of food, from starters, salads and appetizers to poultry and seafood. A versatile food partner, great with glazed hams. Check out our video with wine expert Marc Supsic for more information! For those who enjoy a red, but want something a little lighter and more elegant, we suggest Pinot noir. Oregon is well-known for its beautiful French-style Pinots and this one from Eola Hills Winery comes with 35 years of experience in the bottle. This is dry, tart and full of fresh cranberry and raspberry flavors, which means it’s perfect for the Thanksgiving table. Pair it with pork, turkey and especially, duck. Get some Holiday Pinot pairing ideas with wine pro, Marc Supsic. Of course, we know sometimes you just want a wine that tells it like it is. For the big, bold red wine drinker, here’s a beautiful blend, made from five different grapes, that won’t disappoint. McPherson cellars is 100% Texas – that’s right, Lubbock Texas – and La Herencia (Spanish for “Heritage”) is the kind of wine you drink when subtlety is not necessary. Full-bodied, tannic and even a little oaky, La Herencia will stand up to grilled meats, game meats, and even your Uncle Bud’s off-color remarks at the dinner table. Check out our video for a taste of La Herencia! All of our selections are available through Pennsylvania’s Fine Wine and Good Spirits Stores. If you need help locating a bottle of ours, please contact marc@descheres.com and we’ll help you find it at your nearest store.